Recently, the GST Council has discussed the operational details for implementation of recommendations made by the council in 33rd meeting in its 34th GST Council meeting held on March 19, 2019. The council proposed various recommendations to boost the residential segments of the real estate sector. Notification in this regard is pending which shall provide a better understanding of the entire updations. b) Affordable houses# being constructed in on-going projects under the existing Central/State housing scheme eligible for concessional rate of GST i.e. 8% (after 1/3 land abatement). Refer Serial no. 3 of Notification 11/2017-Central Tax (Rate) as amended by Notification 01/2018-Central Tax (Rate). 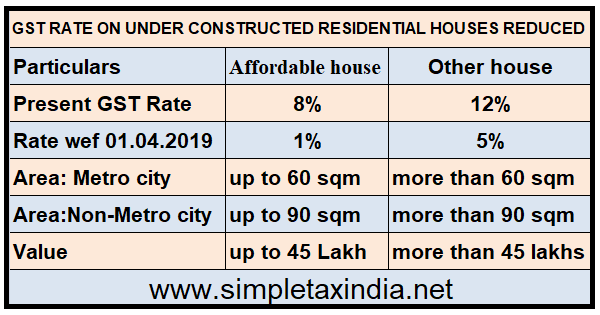 a) All houses other than affordable houses on on-going projects whether booked prior to or after 01.04.2019. However, for houses booked prior to 01.04.2019, new rate shall be available on instalments payable on or after 01.04.2019.
b) Commercial apartment such as shops, offices etc. in a residential real estate project, having not more than 15% of total carpet area of all apartments. Note:- Construction of commercial units shall be taxable @ 12% effectively except commercial units in a residential real estate project, having not more than 15% of total carpet area of all apartments. Input tax credit shall not be available. Transition of ITC shall be available on a pro-rata basis in case of ongoing projects of houses other than affordable and commercial apartments fulfilling the condition mentioned above. D. Time of Supply in case of Supply of Constructed houses to the landowner in a Joint Development agreement shall be the date of Completion certificate. Author of "Comprehensive Guide to Service Tax (14th Edition)"
& "GST Concept & Roadmap (3rd Edition)"